We have new neighbors across the street, and the boys and I made these oatmeal raisin cookies to take to them as a welcome gift, but they almost didn’t make it due to my three-year-old snatching some bites out of them. I caught him a couple times and he just looked at me with a big smile and said the cookies were delicious. I really need to figure out a better place for the wire racks when cooling baked goods, because he can easily reach them on the island. The recipe from America’s Test Kitchen uses a lot of old-fashioned oats and flavors the cookies with nutmeg instead of cinnamon. The nutmeg was nice, but I think I’m a died-in-the-wool fan of cinnamon oatmeal cookies. I do like how this recipe uses extra oats and cuts out some of the flour, which makes the cookies nice and chewy. 2. In the medium bowl, whisk together the flour, baking powder, salt, and nutmeg. Set aside. 3. In the bowl of the stand mixer, mix together the butter and sugars on medium speed until it is light and fluffy, about 5 minutes. 3. Add the eggs one at a time, mixing for about 30 seconds each time. 4. Slowly add the flour mixture while mixing on low, just until the ingredients are combined. 5. Stir in the oats and the raisins gently, just until combined. Make sure that the oats are evenly distributed throughout the dough, otherwise you’ll have clumps of oats that don’t hold together when baked. 6. Scoop a ball of dough and roll it in your hands, then drop on the baking sheet, spacing about 2 inches apart. Continue with the remaining dough. Dampen your fingers with water and lightly press down on the top of each dough ball, flattening it slightly. 7. Bake in the preheated oven for 22 to 25 minutes. The cookies should be golden, but the center should be soft and puffy. Allow the cookies to sit on the baking sheet for 10 minutes, then remove to a wire rack and cool. Your cookies are not flat! 🙂 And they look delicious! Thanks, Cris! My favorite part is the raisins. I started buying big bags of raisins from BJs because having young kids we go through them so fast, and I have to say that those big, plump raisins are very tasty! Oh, of my 3 kids, only the little one likes raisins and I have to hide them from him sometimes. I prefer golden raisins, how about you? I have to admit that golden raisins are my favorite, too! I really like them in granola. 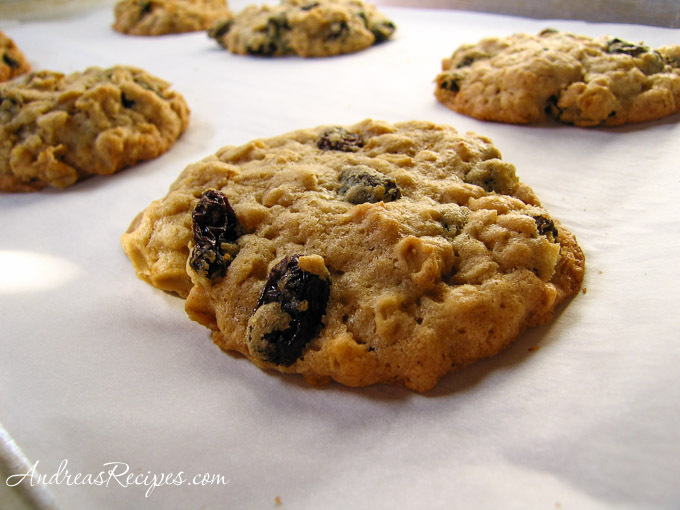 I was looking and looking for a good cinnamon oatmeal raisin recipe. I came across your recipe and thought I would give it a try. My son is an oatmeal raisin cookie expert at age 17 when it comes to taste. He fell in love with these cookies just from the smell. I have to say I added both the cinnamon and nutmeg, and it added that much more to the cookie. I’m baking these as I type. First batch hasn’t come out yet, but the dough is YUMMY. Can’t wait till they’re done to try them. I love this recipe, yummy cookies. Could you please tell me the best way to keep/store unbaked cookie dough? Thanks. Hi Amy, I’m so glad you like the cookies! You can refrigerate or freeze most cookie doughs, just make sure they are tightly wrapped in plastic wrap so they don’t absorb any off flavors and stored in freezer bags. Doughs will keep in the refrigerator up to 3 days and in the freezer up to 6 weeks. Just made a whole bunch for my daughters Brownie’s troop party. Lets see what the 8 yr olds are going to say about it. I loved it. Had 4 out of the oven with my cup of tea. thanks for sharing the recipe. I just baked these cookies for my boyfriend and had one right out of the oven, and oh my gosh this is the best recipe ever! thank you! They are so soft and delicious. I added dried cranberries with the raisins. Thanks again! have to pop another batch into the oven. Just came across your site. Thank you for posting this recipe. I have been trying various oatmeal/raisin recipes and everything else I have ever tasted from /TK has been delicious. The only thing different I will do will be to plump the raisins. To me, that is crucial. I’ll also use cinnamon as well. Thank you!